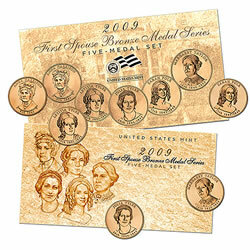 A five-medal set of the 1 5/16" 2009 First Spouse Bronze Medals has been released by the US Mint today. Each set sells for $15.95 and comes with the medals packaged in Mylar®, then inserted into a folded card containing product information. A custom-made envelope is also included. The Mint’s standard shipping charge of $4.95 per order will apply. Each of the medals may also be purchased separately for the price of $3.50 each. The obverse of the Anna Harrison Bronze Medal was designed by United States Mint Artistic Infusion Program (AIP) Associate Designer Donna Weaver and sculpted by United States Mint Sculptor-Engraver Joseph Menna. The reverse design, by AIP Master Designer Thomas Cleveland and sculpted by United States Mint Sculptor-Engraver Charles L. Vickers, depicts Mrs. Harrison sharing her passion for teaching with her students. The obverse of the Letitia Tyler Bronze Medal was designed and sculpted by United States Mint Sculptor-Engraver Phebe Hemphill. The reverse, designed by AIP Master Designer Susan Gamble and sculpted by United States Mint Sculptor-Engraver Norman E. Nemeth, depicts Mrs. Tyler and her two oldest children behind their Cedar Grove Plantation, where she and John were married in 1813. The obverse and reverse of the Julia Tyler Bronze Medal were designed by AIP Master Designer Joel Iskowitz and sculpted by United States Mint Sculptor-Engraver Don Everhart. The reverse design depicts President and Mrs. Tyler dancing together at a White House Ball. The obverse and reverse of the Sarah Polk Bronze Medal was designed and sculpted by Hemphill. The reverse design depicts Mrs. Polk working in the White House in support of her husband’s career. The obverse of the Margaret Taylor Bronze Medal features a portrait designed by Hemphill and sculpted by Vickers. The coin’s reverse, designed by AIP Associate Designer Mary Beth Zeitz and sculpted by United States Mint Sculptor-Engraver Jim Licaretz, depicts Margaret Taylor comforting an injured soldier during the Seminole War. For images of all the medals, see First Spouse Medal Images. Those interested in purchasing the five-medal set can do so online at the Mint’s website: www.usmint.gov or by calling the toll-free number 1-800-USA-MINT (872-6468). Hearing and speech-impaired customers may place orders and inquiries through TTY at 1-888-321-MINT (6468), Monday through Friday from 8:30 a.m. to 5:00 p.m. (ET).